As I glance at my calendar, I see that today is Red Day. Red Day. I head downstairs to the laundry room to grab the red shirt I washed yesterday. I’m going to need it today. Red Day. What does this mean? It’s not women’s heart health awareness day, or Red Ribbon Week, where schools talk to students about being drug and alcohol free. No, today has nothing to do with these worthy causes. Today is Red Day, where we wear red, talk about red, sing about red and play with red. 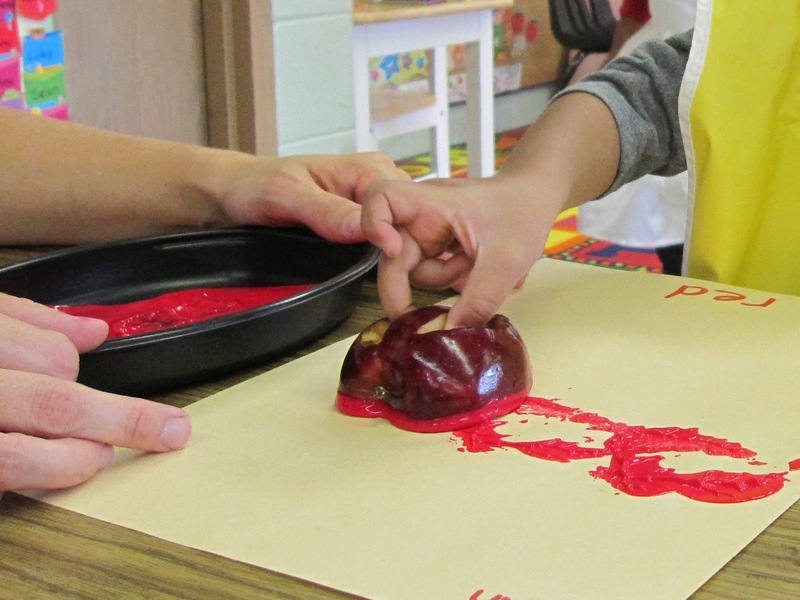 We are teaching the color red at preschool today! RED. Today it’s just a color. Wouldn’t it be lovely if all our colors of awareness were someday just colors? If heart disease didn’t have the color red for awareness because it didn’t exist? I’m thinking the same thing about PINK. I love pink. Emmy’s favorite color is pink. I would love pink to just be pink. 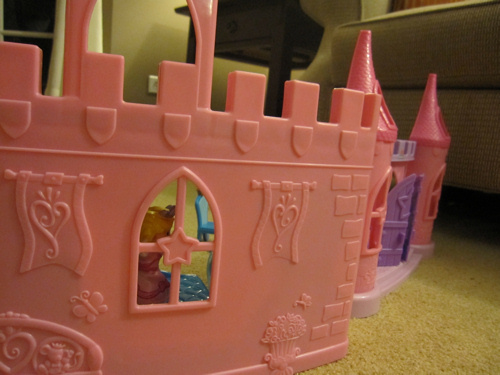 Pink buttons and bows, pink castles and pink sunsets. What would life be…without the month of October saturated with pink? Without the need for breast cancer awareness? Imagine life without breast cancer. I pink it would be a dream come true. Visit Melissa for more Simple Moments. I totally agree! Life was much simpler when we were kids and didn't know about cancer, heart disease and all that. Sigh. Oh, I taught preschool a ba-zillion years ago. 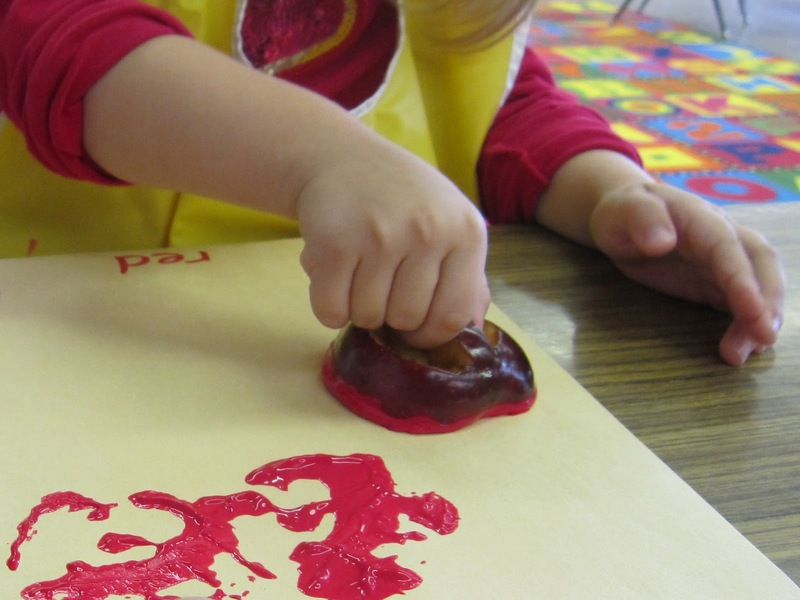 These images of soft little hands doing apple stamping…oh, be still my heart! Thanks for sharing! Yes, I would like that very much! It would be wonderful if a color could just be a color. I love the red day project! It is too bad that there is a need to associate colors to a cause. Maybe one day there won't be! That's a beautiful thought! I've never realized it before, but those colors are REALLY strongly associated with those things now. Sad that they have to be. I really love how you put that, about wouldn't it be lovely for red and pink to have no meaning because heart disease and breast cancer ceased to exist. That's really, really lovely. We've got entire weeks dedicated to the colour orange in the Netherlands. Whenever there are big skating races or football world cup, the only colour you can really see is orange, orange and more orange. And I joined in as well: I've got an orange tulip tattooed on my shoulder!